Nagarhope Ireland is a charity registered with the Revenue Commissioners of Ireland (Charity no: CHY18004) since 2009. Roughly every two months, the Committee meets to discuss programs / projects in Nepal, fundraising, direction of the charity etc. Essentially, Nagarhope Ireland is the donor agency of Nagarhope Nepal, a nepali Non-Governmental Organisation (NGO), although there is no legal connection. Nagarhope Ireland is run on an entirely voluntary basis by members and is well supported by the immediate community in the vicinity of Lucan, Co. Dublin, Ireland, where meetings are held. The majority of funding for Nagarhope Nepal comes directly through the bank account of Nagarhope Ireland. In April 2011, members of Nagarhope Ireland’s Committee visited Nepal, some for the first time, and saw some of the projects and schools first hand. This served to bolster the work that we do in Nepal, creating awareness from a different point of view, and serves as a reminder to us in Nepal that the standards we set are always being questioned and scrutinised, and rightly so. 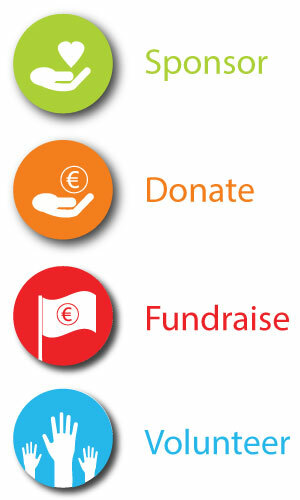 Fundraising and individual sponsorships, as well as once off donations, are the bread and butter of the organisation. Awareness of our work and fundraising efforts are also vital, through local media, schools, social media, radio etc . . . To see a selection of fundraising efforts over the years, see the past events section. Primary and secondary schools in the immediate Lucan area and beyond have been a great source of funding for Nagarhope, especially in the immediate aftermath of the 2015 earthquakes. Every few years, our founder Doc, takes time off to give talks in such schools at their request in order to showcase and highlight the ongoing work of Nagarhope being done in Nepal through slideshows, videos etc. Thanks to all for continued support, and of course to all of the individuals who’s unwavering support has allowed Nagarhope to continue helping the people, and in particular the children, of Nepal.